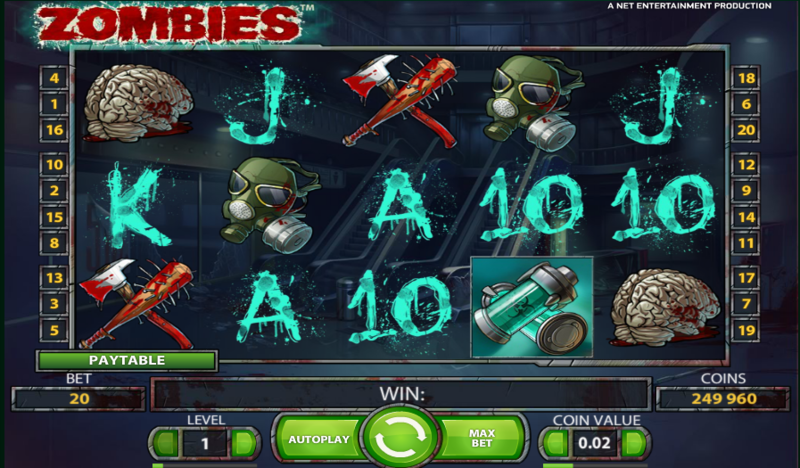 The Zombies is a horror-themed video slot game with some of the creepiest symbols. If you’re into horror movies, or just want to tune yourself into the spirit of the season, Halloween, that is, this game will surely provide good entertainment. There are 5 reels and 20 paylines. There are five special features, and the prizes go up to 100,000. The Wild Symbol takes the place any other symbol, except for the Scatter. The symbol appears only on reels 1, 2, 4 and 5. Sometimes the symbol enables a combination to be completed, providing an extra win. There are also Stacked Wild symbols that only come on reel 5, and they cover 1-3 symbols. If the Stacked Wild symbol only partly appears, it will move to complete a combination that could possibly form on the winning lines. However, the Stacked Wild cannot be taken advantage of during the Free Spins mode. You can get a Random Wild only after a spin that didn’t have a Free Spin or a Stacked Wild embedded in it. The Random Wild is an exciting feature. It can turn up to 6 symbols Wild and significantly increase the chances of getting a winning combination. The Scatter symbol can appear on reels 2-4. Three Scatter symbols will cause a series of 5 Free Spins. The line winnings will also be multiplied after each Free Spin. The multiplier is 1 on the 1st round, 2 on the 2nd round, 3 on the 3rd round, 5 on the 4th round and, surprisingly, 10 on the 5th round. Unfortunately, it’s not possible to get any additional Free Spins during the Free Spins mode, but the Zombie Score can be activated. After each round the reels will disappear as the zombies show up. A rifle will then slaughter the zombies and a prize is awarded for each dead zombie (aren’t they already dead? ), the prize money depending on the bet made in the round that activated the Free Spins. Coin values are 1 cent, 2, 5, 10, 20 and 50 cents, as well as 1 euro, and the coins can be bet differently by adjusting the coin value and bet levels. There can be only one win per payline, and the highest win on a payline will be calculated. The winning combination should start from the leftmost reel and go all the way to the rightmost reel. Clicking a symbol will open a pay table for that symbol. Try out Zombies. Pull yourself together and face your fears!